1. Preheat your grill to maxim, then lay the bacon on the grill pan or a baking tray and slide underneath. Grill for 3 minutes on each side for crispy bacon. 2. Meanwhile, cut your avocado in half, remove the stone and scoop out a generous tablespoon of flesh from each half to create a hole big enough for the egg. No need to waste the leftover avocado – eat it on the spot! 3. Crack an egg into each avocado half, pierce each egg while in a couple of places, season with a little salt and pepper and place on a microwavable plate. Cook the eggs in 30-second hurts for 2 minutes – this should ensure firm whites, but runny yolks. Leave to stand for 1 minute. 4. 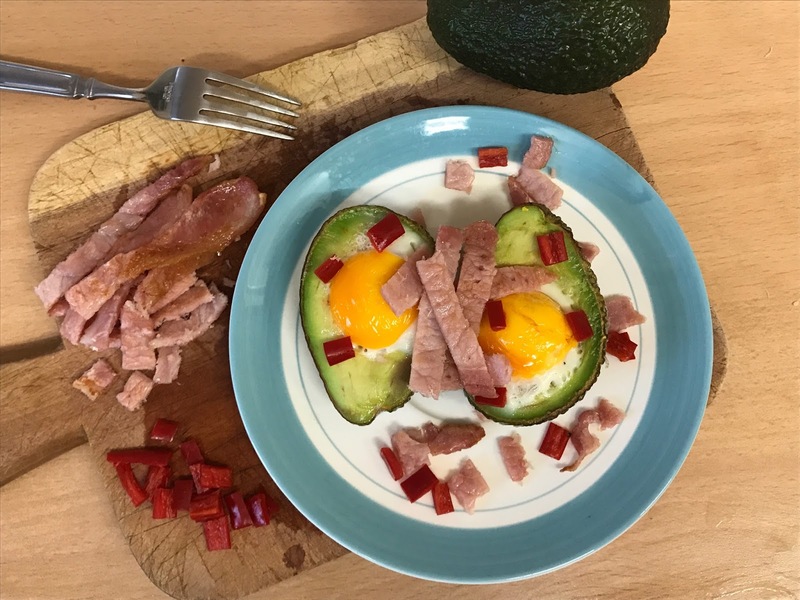 Serve up the baked eggs and avocado with the bacon and a scattering of chilli.